English Literature students at The Sixth Form College, Solihull benefited from the second university lecture in a week, as a representative from the University of Warwick visited recently. 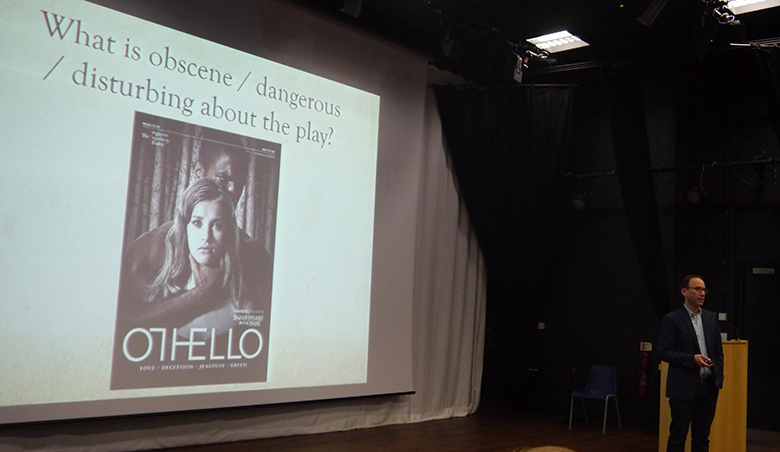 Associate Professor Paul Prescott, from the University of Warwick visited the College to deliver a talk on Shakespeare’s “Othello”. Students who are part of the College’s Shakespeare Academy enrichment are already familiar with Professor Prescott, having attended a bespoke seminar with him at The Shakespeare Birthplace Trust, earlier in the academic year. However, this event was open to all Literature students. The tragedy of “Othello” is a key text for Paper 1 of the English Literature A Level. Having taught and acted Shakespeare in the UK, Japan, China, Cuba, Australia and North America, Professor Prescott was well placed to talk to students about this text. He is also active in script adaptation for professional Shakespeare productions and in 2018 he has adapted the text for productions such as “The Merry Wives of Windsor” (for the Illinois Shakespeare Festival, summer 2018), “Othello” (for the Montana Shakespeare in the Parks, summer 2018) and for the National Theatre’s current production of “Macbeth”, directed by Rufus Norris and starring Anne-Marie Duff and Rory Kinnear. This event followed hot on the heels of a recent university-style lecture from Professor Mark Sandy of Durham University, who spoke to Literature students on the subject of Keats’ Narrative Poetry and Tragic Realisation.